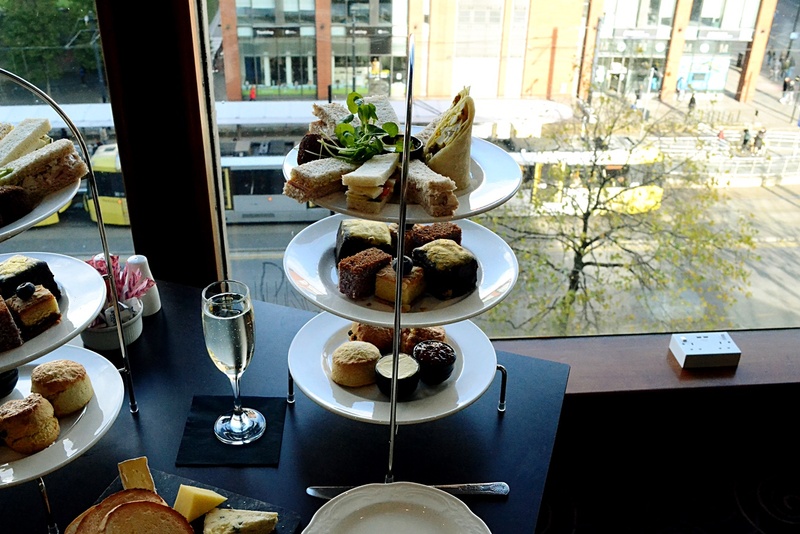 With a host of Afternoon Tea’s on offer in Manchester city centre currently it can be tricky to decide which to go for. 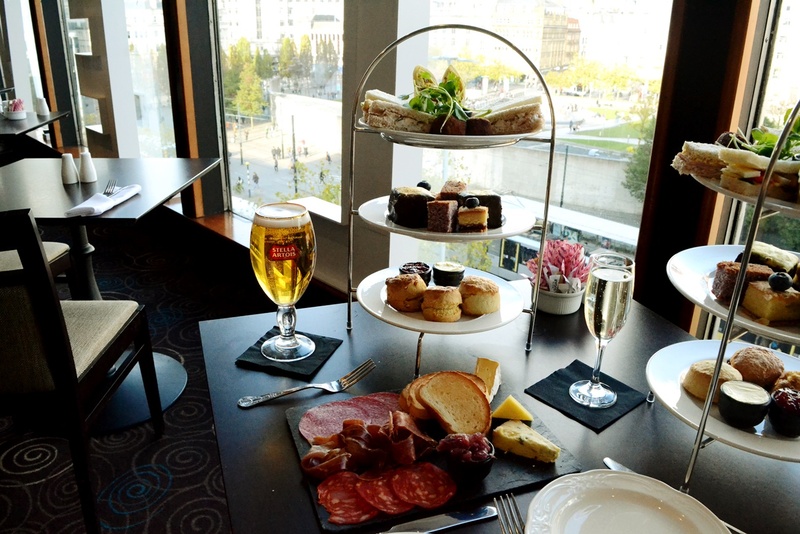 We help you make that decision with our review of latest menu to try at the Mercure. 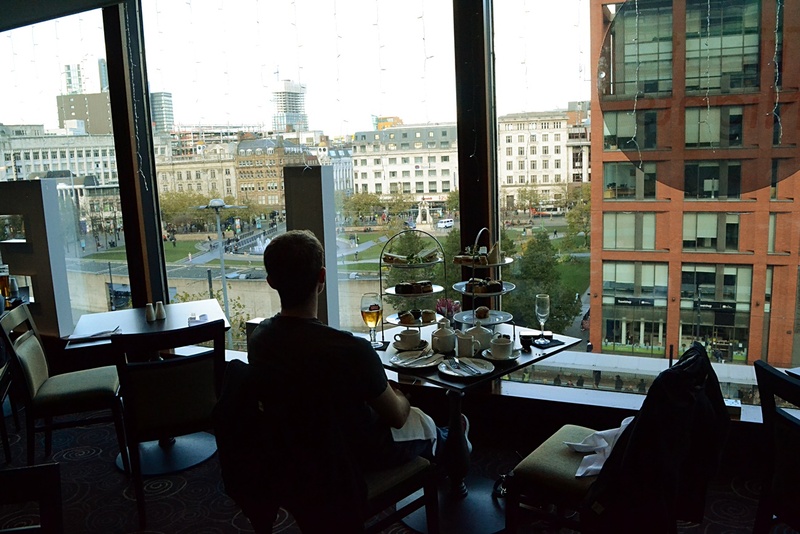 We previously reviewed the Afternoon Tea at the Mercure when a novel ‘Manchester’ theme was introduced in 2017, now 12 months later with a new selection of food on offer we returned to see if the menu lived up to expectation. Boasting panoramic views of Manchester’s renowned Picadilly Gardens, the Mercure hotel is located right next to the tram stop and bus station in the city centre, making it extremely easy to get to. 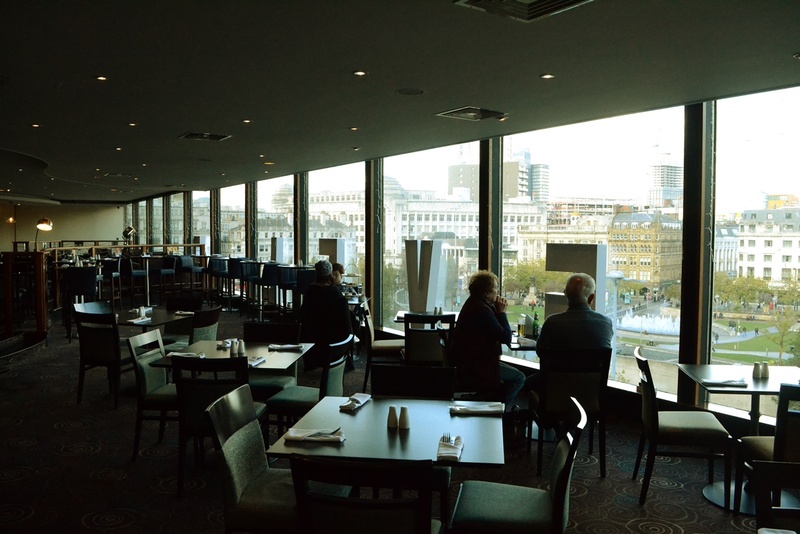 The restaurant floor can be accessed via a lift from outside, giving an elevated backdrop, perfect for people watching from window seats. You get the comfort of indoors with the views of outside. The restaurant itself is spacious yet cosily decorated in a classic decor. Patterned carpets give a traditional feel, with plain dark wood tables and cushioned chairs. As you dine an array of fun pop music is played which gave an upbeat atmosphere. Listening to classics like Madonna and the Spice Girls made you want to sing along and was perfect for 90s kids to enjoy some guilty pleasure classics. 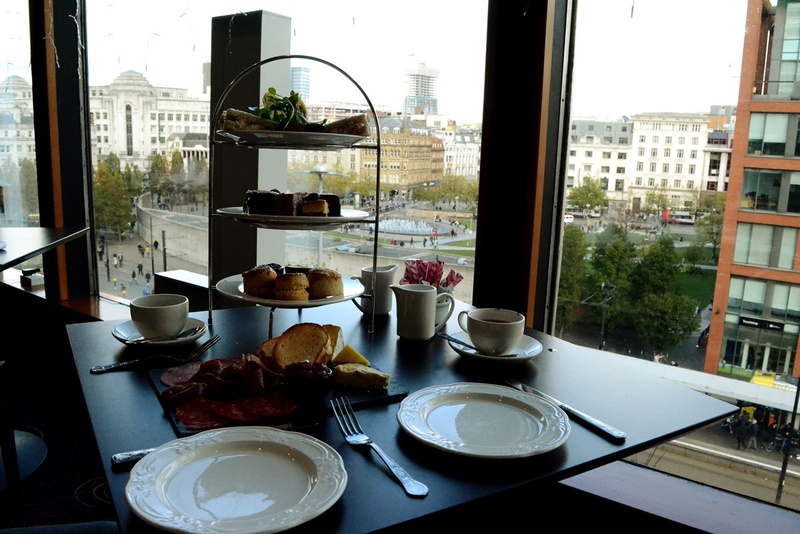 The Gents afternoon tea features the expected selection of sandwiches, 3 types of scone with clotted cream and jam and cake bites. 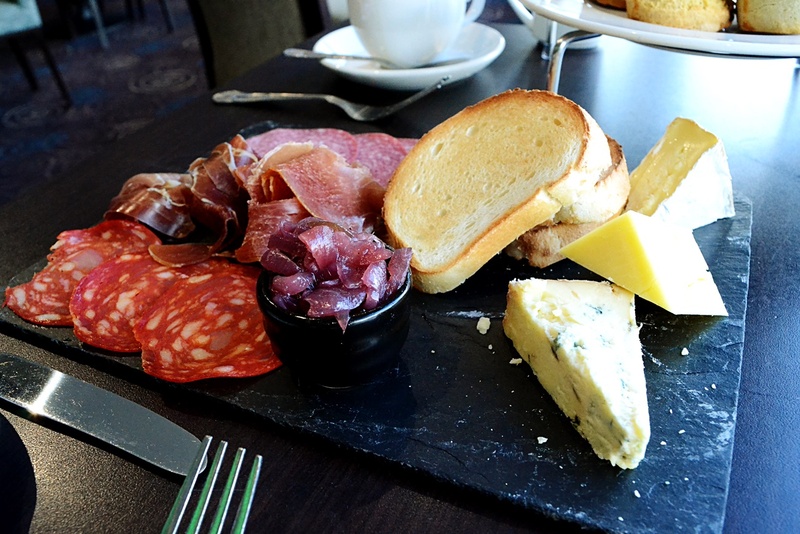 In addition, the choice comes with a pint of beer (selected) and a cheese and meat board. Tea is also served. The Ladies option also has sandiwches, cakes and scones on offer, but instead of beer comes served with a glass of Prosecco. It also has some added savoury bites to balance things out. The service was not to be faulted from the start, our waiter took time to talk us through all of the options available and recommended beer to suit. If anything was missed a quick prompt ensured things were amended hurriedly and in a professional manner. On to the food itself; having 3 flavours of scone gave something a little extra compared against other afternoon tea offerings, the usual plain and raisin options came with an additional caramel popcorn third choice. The cream was thick and rich, whilst the jam was more of a jelly which made it a little tough to spread but less messy overall. The drinks were nice and simple, with a Prosecco and beer but we would’ve liked more variation of tea selections as the standard English Breakfast was all that was on offer. The Cheese Board made a nice addition, it gave more than enough to eat which some may struggle with but there is always the option to get anything you can’t manage to take out for later. The cakes were fanciful, giving fruit and coconut flavours. One particular highlight was the square Jaffa Cake, coated in thick chocolate and dusted with gold on top for a pretty finish. Celebrate Christmas with Eclectic Hotels! "Lullabellz Synthetic Hair Extensions Review"